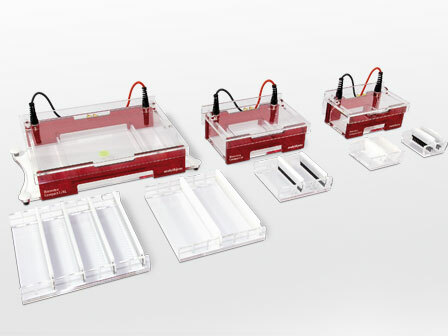 Various details provide for ease of use: The safety lids open upwards giving free access to the chamber for sample pipetting. Besides that opening the lid upwards avoids the risk of sample and buffer spillage as often seen with sliding lids. The open Bigfoot Lid can be space-saving set upright on its back. 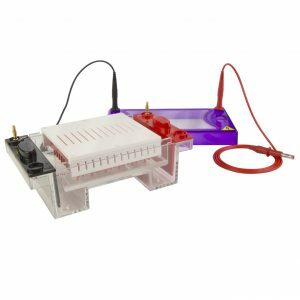 The walls of the buffer chamber are partially cut out to enable an easy removal of the gel tray without touching the buffer. The choice of colour-coded 1.0 mm and 1.5 mm thick combs and the optimal number of comb positions per tray provide for high flexibility in applications. 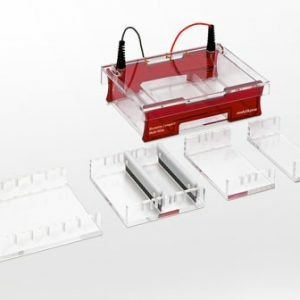 Compact L/XL features four levelling feet and a bull´s eye level to ensure uniform runs with large gels even on working benches that are not levelled. 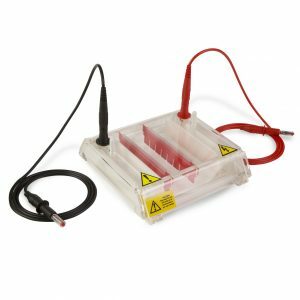 Excellent ”plug-and-cast” casting tanks for tray sizes XS, S and M make leakfree gel casting a matter of seconds: just drop the gel tray in and fix with minor contact pressure. For maxi gels an easy-to-handle gel caster with levelling feet and bull´s eye level can be used for both tray sizes L and XL. 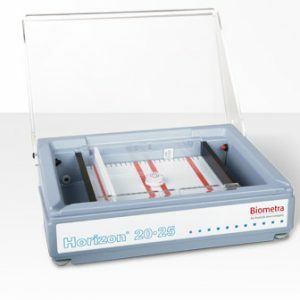 Additionally, gel trays of other Biometra electrophoresis systems can be applied: Horizon® 20•25, Agagel maxi (20 cm x 20 cm gel tray). Certainly also the simple method using tape for tray sealing can be applied when somebody is used to do it that way.